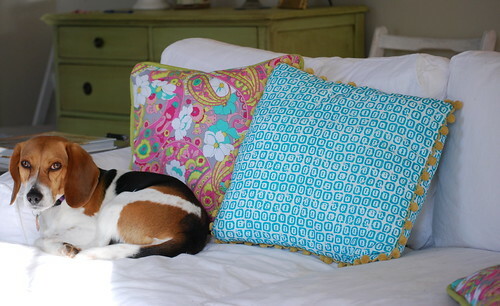 Inject a little energy in your space with some spicy new pillow slipcovers! It only takes a few minutes and the result will revive your space! I found the turquoise fabric at Walmart…5 yds for $5. I found the gray floral at a local fabric store. It’s called Catalina by Laura Berringer for Marcus Fabrics. 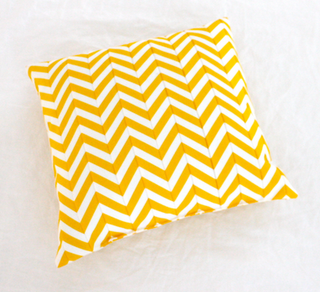 I have some gray and white striped fabric and was thinking of doing this chevron tutorial…but I’m lazy…so probably not. I’ll just buy a yard of chevron fabric. And YES, I let Ally lay on my new pillow slipcovers because she’s loyal and will sit with me through four seasons of ‘Friday Night Lights’…back to back…with no complaining. Do you have some fun fabric lying around? Use it to spice up your pillows! edit: Linking to Centsational Girl’s Spring Linky Party. How fun! I love the fabric you chose! Love the blue you got at WALLYMART! I wish ours had fabric, so spring like…love it! @anonymous…ok. i'll see what i can do. I want to learn to make sofa slip covers. Love seeing your pooch up there enjoying the sofa. I once decorated my Christmas tree and entire house while watching too many episodes of FNL. I must say to a fellow fan, QB1 is so much better as a vulnerable high schooler than a hot doctor in some third-world country or wherever they're supposed to be. Oh, and awesome slipcovers! I'm a fan or yours too.